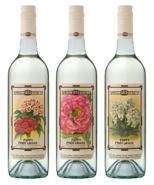 Spring Seed Wine Co produces a ‘Foget-me-not’ Sauvignon Blanc Semillon, a ‘Four O’clock’ Chardonnay, a ‘Poppy’ Pinot Grigio, an ‘Aster’ Pinot Noir and a ‘Scarlet Runner’ Shiraz from our estate grown, organically certified vineyards. We also make the ‘Sweet Pea’ Moscato. The labels are unashamedly inspired by vintage flower seed packets created at the turn of the century. The colour, clarity and beauty of the original seed packets are quite remarkable. 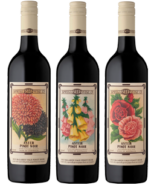 We chose three different flower images to adorn each one of our McLaren Vale wines, simply because they are quite lovely. The old-fashioned look of the seed packets (and our labels), and the painstaking attention to detail involved in the creation of the original artwork resonates clearly in the traditional, meticulous practises we employ in both vineyard and winemaking. Spring Seed Wines are single vineyard wines that best express the unique characteristics of our foothills site, in a fresh, balanced style which appeals to wine lovers everywhere. Traditional vinification and natural minimal processing, combined with organic viticulture helps us capture the purity, integrity and flavour of our vineyard in the Spring Seed Wines.